The fatal blow was definitely not the first hit. For 13 months, icebergs had plowed over Mooring SF1, again and again. 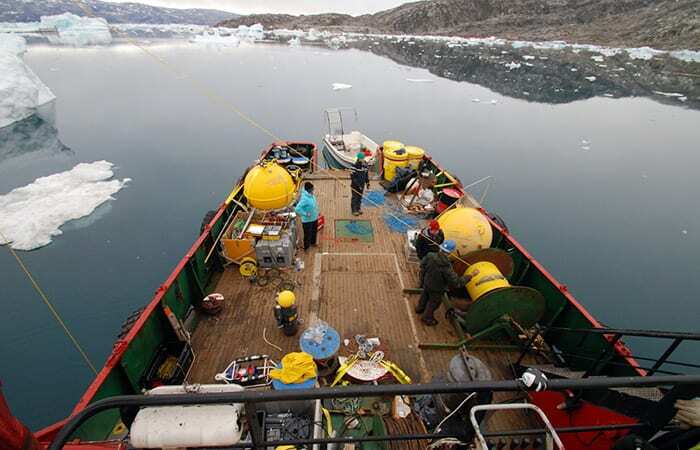 They pushed down underwater scientific instruments on the long mooring line toward the seafloor in a Greenland fjord. Usually, these chunks of ice—sometimes as tall as a skyscraper and as wide as seven city blocks—would hold down SF1 for several hours and then move along, allowing SF1 to resiliently float back up. 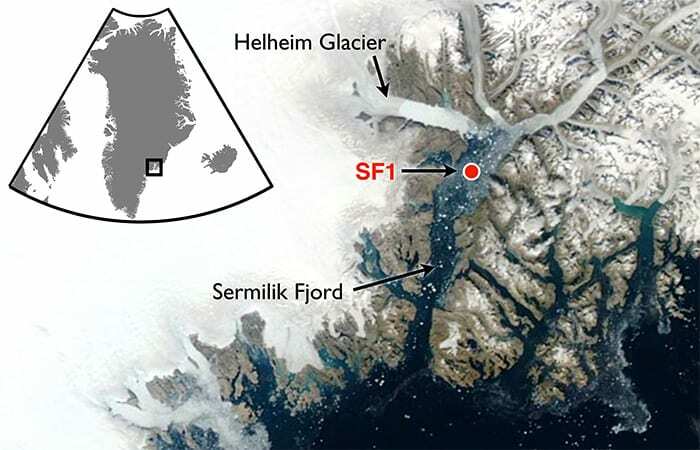 This may not seem like a safe location for scientific equipment, but our research group deliberately placed SF1 in the line of iceberg fire in Sermilik Fjord, 20 miles from the terminus of Helheim Glacier. This narrow coastal inlet, abutted by steep cliffs, connects at one end to the open ocean; at the other end, the vertical ice face of the glacier forms a back wall nearly 2,000 feet tall. Sermilik, one of the many fjords on the east coast of Greenland, is long (60 miles), narrow (4 miles wide) and deep (½ mile). You would need go hundreds of miles offshore of New England to reach water this deep. But in Greenland, the cliffs that line the fjords extend far beneath the ocean surface, forming underwater canyons that connect the open ocean to glaciers. 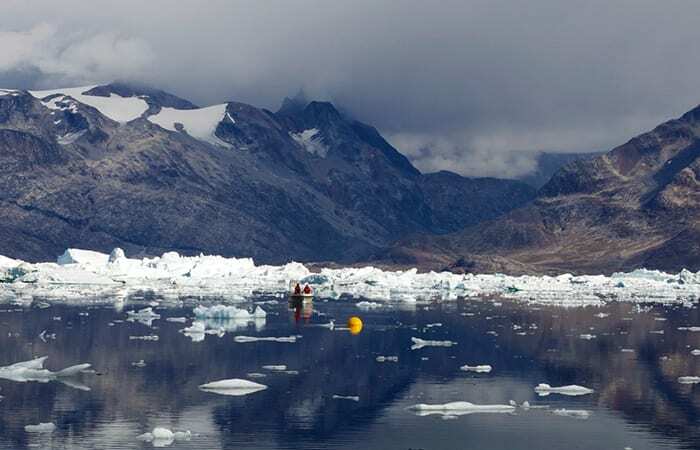 In this deep water near Helheim Glacier, our team, led by scientists Fiamma Straneo of Woods Hole Oceanographic Institution (WHOI) and David Sutherland of the University of Oregon, assembled Sermilik Fjord Mooring No. 1 (hence SF1) off the side of a ship. Setting up a tower of underwater instruments is no small feat. First, we surveyed the area for a promising location, using an echo sounder that bounces sound waves off the seafloor. Then, piece by piece, we connected and snaked out SF1’s various components along the water’s surface, starting from the top: floats, wire, instrument, wire, another instrument, wire, instrument, and so on. Last, we attached the anchor and released the whole contraption. As it fell to the seafloor, the anchor pulled the string of instruments, wires, and floats into the fjord’s abyss. If all went well (though there is no way to tell at deployment), the anchor would end up at the bottom. At the top, a buoyant top float would stretch a vertical but flexible, ¼-mile-long cable strung with instruments measuring water temperature, salinity, pressure, and velocity. We also deployed several other moorings elsewhere in the fjord, in safer locations much farther from the glacier. The lower half of SF1 looked like a standard oceanographic mooring, but unlike many moorings, it had no buoy at the ocean surface. The mooring ended 1,000 feet below the surface with a buoyant float—an orange, metal sphere that holds the whole apparatus upright. The mooring was specially designed to stop short of the surface to lessen the chances of iceberg collisions, though obviously it could not avoid them all. Helheim Glacier and many others around Greenland are slow-moving rivers of ice that drain the Greenland Ice Sheet into fjords. 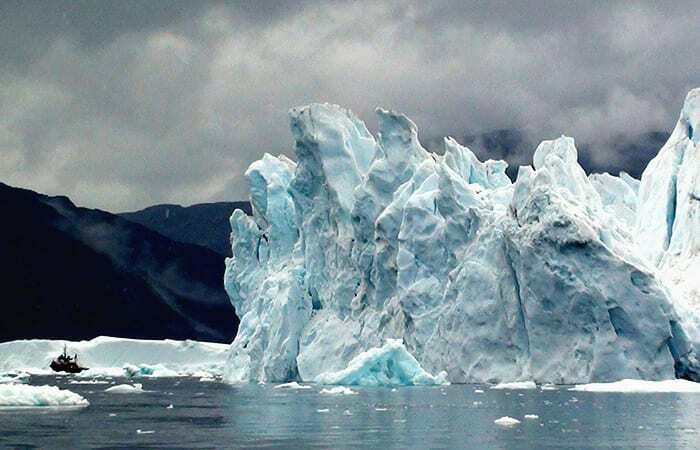 The fjords receive a hefty influx of icebergs breaking off the glaciers’ terminuses, as well as water from ice that melts—both on ice sheet’s surface and at the underwater interface where glaciers meet the ocean. Ice lost at the ice sheet’s margins counteracts snow accumulation atop the ice sheet. If the accumulation and loss do not exactly balance, the ice sheet will shrink or expand. In recent decades, both the flow of glaciers and surface melting of the ice sheet have accelerated, causing a net loss of ice. Scientists largely understand why surface melting has increased: Air temperatures around Greenland have warmed. But why have the glaciers accelerated? And before we get to that question, why should we care? When glaciers accelerate and the Greenland Ice Sheet shrinks, the lost ice ends up as water in the ocean. That raises global sea levels. Currently, the imbalance in Greenland increases sea level by 0.3 inches per decade, about a quarter of the total rate of sea level rise over the past two decades. To project future changes in sea level, however, we need to have a much better understanding of how glaciers will behave. 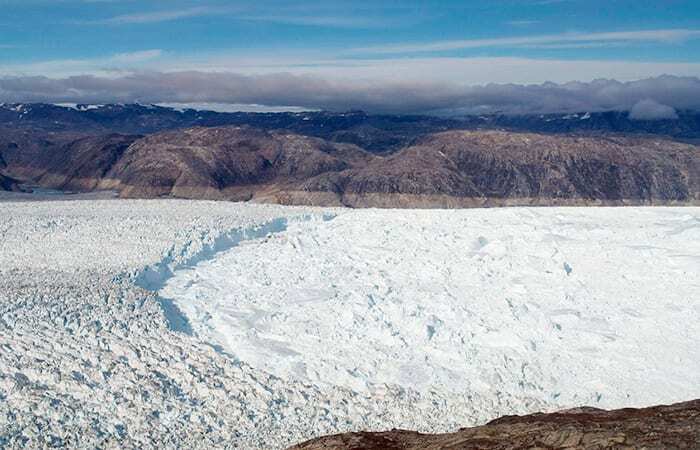 So scientists have begun investigating the trigger behind Greenland’s accelerating glaciers. 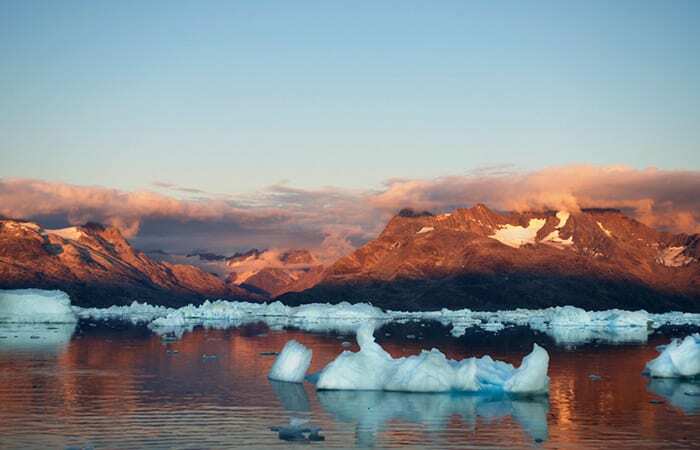 Previous studies have found a correlation between faster-flowing glaciers and warmer ocean temperatures around Greenland. This observation, combined with glaciological studies, has led to the hypothesis that warmer waters may be increasing underwater melting (think ice cubes melting faster in a cup of hot water versus cold water) and triggering an acceleration of glaciers. Yet, we know almost nothing about the water that makes direct contact with glaciers in Greenland’s remote, iceberg-laden fjords. They are hard to access and remain largely unexplored. All measurements of warming trends around Greenland have been made in the ocean off the coast, outside the fjords and far from the ocean/glacier interface. A few scientists have begun studying these fjords by making measurements during brief summer surveys. But just as recording the weather in Boston for a few days during the summer will not tell you much about Boston’s climate or temperature fluctuations, neither do snapshot surveys of fjords tell us much about temperature variability near vulnerable glaciers. So our research group designs moorings like SF1 to leave instruments in a fjord throughout the year, measuring ocean currents and water temperatures that drive melting at the glacier’s edge. Thirteen months after we deployed SF1, we headed back into Sermilik Fjord on a larger ship, the M/V Fox, to recover our moorings. At the same time, unknown to us, a particularly large iceberg moved over SF1. It held the mooring down for several hours and then continued its journey out of the fjord. But this time, the mooring did not spring back up. The buoyant orange sphere atop the mooring line was designed to sit 1,000 feet below the surface and to withstand the immense pressure at this depth. However, when this iceberg pushed the sphere down to 1,500 feet below the surface, the metal sphere collapsed. It imploded, crumpled like a used paper cup, under the weight of a quarter mile of water. Having lost its buoyant sphere, the entire structure—instruments, wires, floats and all—plunged to the seafloor. Meanwhile, aboard the M/V Fox, we had no inkling of the misfortune befalling SF1, but we were experiencing iceberg troubles of our own. The ice pack in the fjord was dense, and our large boat could not maneuver through the icebergs to reach the upper fjord. So we turned around, abandoning hope of recovering SF1 until the next year. We did, however, recover a companion mooring, SF4, located farther down the fjord and away from the glacier. When I returned from fieldwork, I began analyzing the data collected by this mooring. The records showed that fast currents shot up and down the fjord, reversing directions every few days throughout the winter. These velocity pulses were driven by winds and ocean currents outside the fjord. They constantly flooded the fjord with new water, causing large temperature changes. These findings were exciting, but their relevance to the glacier was not entirely clear. Since we could not recover SF1, I could not tell if these fast currents made it all the way to the upper fjord and directly changed water temperatures near the glacier, where SF1 lay. 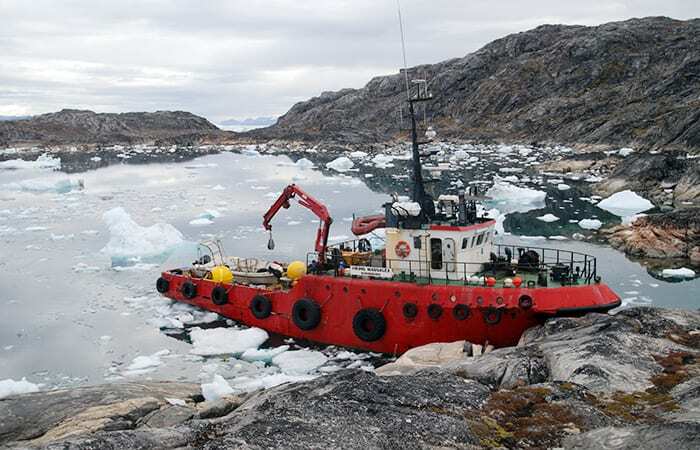 Two years after SF1’s deployment and one year after its collapse, we headed back to Greenland for a second attempt at recovering the mooring. We made our way up the fjord in a smaller boat, sneaking through the ice, and arrived at the site of SF1 on Aug. 22, 2013. We transmitted acoustic pings to communicate with receivers on the mooring, telling it to release its anchor. But, with an imploded float and no buoyancy, the mooring did not come zipping up to the surface. Luckily, mooring technician Will Ostrom had prepared for this. He had brought along a custom set of grappling hooks and a plethora of chains, weights, ropes, and wires. We were going to go fishing for our crumpled mooring. This endeavor is equivalent to retrieving a lost bracelet at the bottom of swimming pool with a string and hook in the dark. We started by surveying the area with our acoustic pinger, which reported the range between our boat and the mooring and let us triangulate a more precise position of SF1 on the seafloor. This is no exact science, though. We lowered an anchor down at our best-guess location. Then we steamed away from the center of our target zone and spooled out chain, hooks, and weights. Once these were lying on the seafloor, but still connected to the ship with a rope, we drove in a wide circle, sweeping the mess of gear along the seafloor in hopes of hooking a piece of the lost mooring. Then we pulled in the gear to check for a catch. We tried this several times until we had to quit for the day, tucking the ship into a small inlet off the fjord to sleep away from icebergs. Early the next morning, we tried again, with more weights and hooks this time. We swept an even larger circle, all the while dodging and circumnavigating icebergs. As we were about to give up, the wire tightened, heeling the boat to its starboard side. We had caught something. We hauled in, and SF1 surfaced, piece by piece, tangled up in our dragging gear. Last onto the ship’s deck was the rusty, imploded, orange sphere. The instruments on SF1 survived all the trauma. The pressure sensor, along with a fortuitously placed GPS unit, allowed us to reconstruct the details of SF1’s story. In 2012, we had used a helicopter to place GPS units on five icebergs to track their paths and see how long icebergs stay in the fjord. By coincidence, it was one of these icebergs that hit and sank SF1. 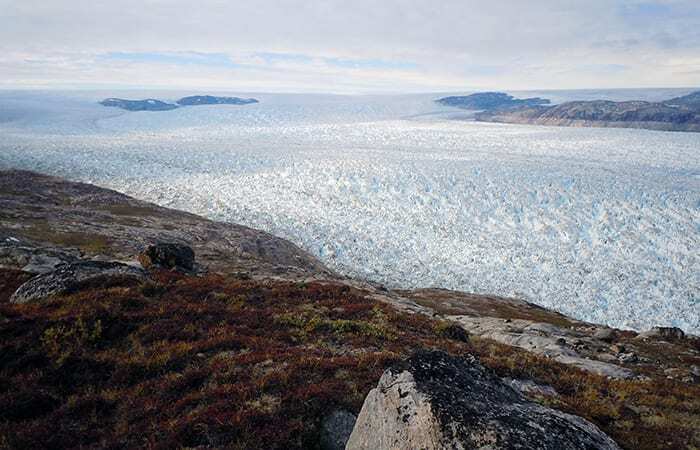 SF1’s instruments gave us records of temperature, salinity, pressure, and velocity that were longer and closer to a major glacier than any previous scientific studies in Greenland. We found that the fast pulses of water recorded by our other mooring, SF4, do make it to the upper fjord near the glacier and drive large temperature fluctuations there. Changes in water temperature outside the fjord on the continental shelf get rapidly transmitted toward the glacier. If we want to effectively model and predict how glaciers melt at their submarine terminuses, we must take these pulses into account. This scientific finding from SF1 contributes just one piece in a complex puzzle of ocean/glacier interaction, which itself is only one component needed to predict sea level rise in the future. To get more answers, we need to continue putting moorings in the line of iceberg fire, inching our way toward the glacier with better and more innovative designs to measure what happens where glaciers meet the ocean. This research was funded by the National Science Foundation’s Division of Ocean Sciences and Division of Polar Programs and by Woods Hole Oceanographic Institution’s Ocean Climate Change Institute, with logistical support from Greenpeace International. A satellite image shows Helheim Glacier, one of many glaciers that drain ice from the Greenland Ice Sheet into coastal fjords that connect to the open ocean. 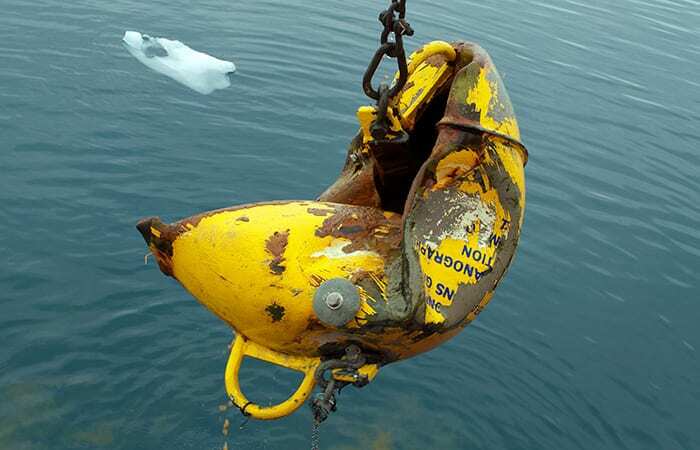 Rebecca Jackson, a graduate student in the MIT-WHOI Joint Program, was part of a team that deployed a mooring, named SF1, near the terminus of the glacier in Sermilik Fjord. 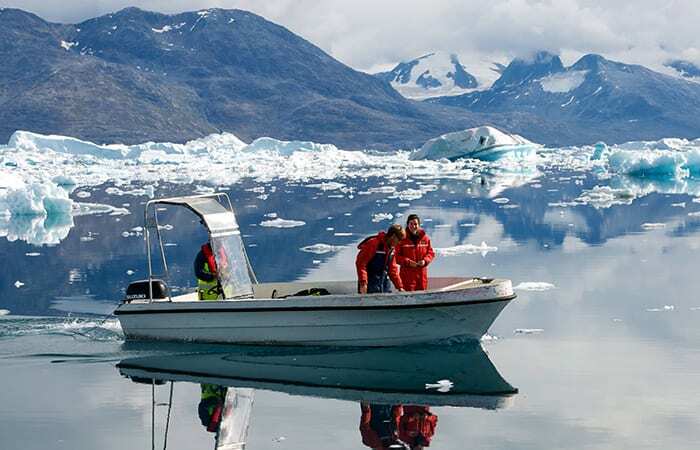 The researchers are investigating fjords as links between glaciers and the open ocean, and in particular, the role of warming ocean waters and underwater glacial melting in accelerating the flow of glacial ice into the ocean. If more ice melts into the ocean than accumulates on the ice sheet via snowfall, global sea levels rise. Helheim Glacier is a river of ice flowing in this photo from left to right, from the ice sheet dominating the interior of Greenland to the coast. The ridge of ice is the terminus of Helheim Glacier, where it flows into the ocean. To the right of the ridge, the fjord is covered by a thick melange of floating icebergs and sea ice. That makes the region near the glacier's terminus inaccessible by boat. On the mountains in the background, you can see a "bathtub ring" indicating the previous extent of the glacier before it had thinned and retreated in recent years. Icebergs calving from Helheim Glacier drift into Sermilik Fjord, posing a danger to instruments deployed in the fjord. WHOI graduate student Rebecca Jackson, right, and Dave Sutherland of the University of Oregon conduct operations from a small boat on Sermilik Fjord. A huge iceberg looms over the 82-foot-long M/V Viking Madsalex in Sermilik Fjord. 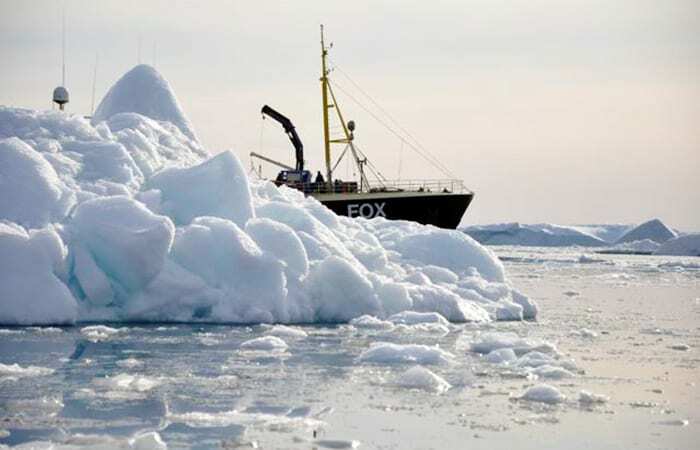 The research team returned to Sermilik Fjord in 2012 aboard the M/V Fox to recover their moorings, but the water in the upper fjord was too clogged with ice and they could not reach the site where they deployed the SF1 mooring.